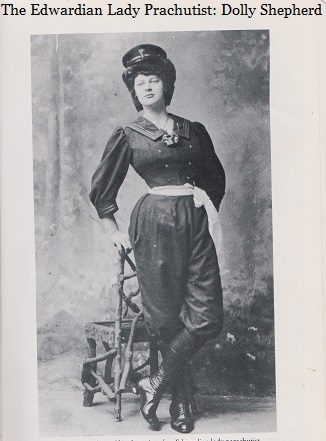 We were recently contacted by Debra Wallace, who had used our Historical Directories collection to help research the life of Dolly Shepherd (1886-1983), an Edwardian Lady Parachutist. I found Debra’s account of Dolly’s life so fascinating that I asked to share it on the Special Collections Blog. I’m very grateful to Debra for agreeing to publish the below text. We’re delighted to have been able to help fill a gap in the Dolly Shepherd story, and pleased to be able to contribute to Debra’s aim to ensure that her remarkable life is rightfully remembered. My name is Debra Wallace and I wanted to say a deep felt thanks to the University Archives and Special Collections Department for keeping Historical Directories accessible to the general public as part of the Special Collections Online. On August 14th 2015, purely by accident, I came across Dolly Shepherd, born in Potters Bar in 1886. Dolly Shepherd was an Edwardian Lady Parachutist and also worked at her aunt’s Ostrich Feather Emporium in Holborn. So earlier this year, purely on a whim, I decided I wanted to find out where exactly the shop building stood in Holborn and the door number. After some internet searching I was led first to the Historical Directories on your website and started my search by choosing selected period of time. I naturally first searched by Dolly’s aunt’s name and the address and then, after a period of time, I realised the shop may be in her uncle’s name. Not knowing his surname, I decided to push forward, looking through what felt like endless pages of information, trawling through, till I was rewarded with a full name and address looking back at me in black and white from the Post Office London Directory, 1910. Post Office London Directory, 1910, showing William Baumann living at 136 Theobald’s Road. As an Edwardian Lady Parachutist, Dolly Shepherd entertained UK crowds in the early part of the last century, most notably at The Alexandra Palace in Haringey where there is now a large painted wall mural of Dolly Shepherd and her boss, the aeronaut, Captain Auguste Eugene Gaudron. In order to perform a parachute jump, Dolly would ascend by a hot air or gas balloon and travelled up to the heights of 2,000ft, and at one time over 10,000ft, only holding on to a trapeze bar attached to a limp parachute, attached to a balloon. Once the parachute was detached, there was a 200ft drop (freefall) while waiting for the parachute to fill up with air and open. If the parachute failed to open, or there was some other malfunction, a parachutist could be killed. Dolly Shepherd, herself, had the odd scrape and brush with the death, the most notable being when she performed the first mid-air rescue over Longton in Staffordshire on 9th June 1908, by saving the life of another parachutist. This act left Dolly paralysed. On finding out that she may never walk again and could die, she defied Doctors by learning to walk after crude electric shock treatment to her back. After a little over two months recovery, Dolly later returned to her first love, parachuting, returning to the Ashby de la Zouch Showground. Dolly Shepherd now holds a Guinness World Record for this act of bravery for this rescue. To think Dolly would have been up in the air before a plane had taken off the ground in the UK and Europe, is for me, truly amazing. The Dolly Shepherd Story continued throughout WW1 when she served her country with the Emergency Women’s Corps and then as a Female Driver/ Mechanic in the WAAC’s based in France near the Western Front. She faced many challenges before becoming accepted by the men she was serving with. This is because women in these roles were not always welcomed as they freed up the men who would then have to go down the front to fight. After WW1 Dolly (Mrs E. Sedgwick) was married and during WW2 she managed Air Raid Shelters in Lewisham, South East London and was commended in a London Newspaper in 1940 for her Home-front Work. Dolly Shepherd was one of the very few, if not the last of the Edwardian Parachuting Generation, some of her counterparts and friends dying during performances. In her later life Dolly lived in Eastbourne, living to the age of 96 and passing away on the 21st September 1983. As an Edwardian Lady Parachutist, Dolly is quoted as saying that she enjoyed her time spent in Ashby de la Zouch. I am personally grateful to the town museum for being the torch bearers with a permanent installation dedicated to parachuting Dolly Shepherd and for keeping her story alive to a 21st Century audience and this coupled with the street naming in the town in her honour: The Dolly Shepherd Close LE65. Since discovering Dolly Shepherd and voluntarily researching her life, I have been on an amazing journey of research which has given me a passion to have the life of Dolly Shepherd respectfully remembered and honoured officially in the places in the UK she has connections to. I have been blog posting about Dolly Shepherd since August 2015 and in February this year I launched a Blog dedicated to ‘My Dolly Shepherd Journey’. I know, I write from a romantic view point when it comes to Miss Dolly Shepherd. All I say to this: as someone who has had to learn and develop new skills as my DS journey has gone on, I enjoy finding about the actual facts as much as the stories, so that I am able tell others of this amazing woman in the way of both a fan and an oracle. When the Dolly Shepherd autobiography When The ‘Chute Went Up (now out of print) was being compiled, Dolly herself felt that no one would be interested in her life story and that it was a “fuss about nothing”. Surely now, it is that ‘nothing’ that is worth making the ‘fuss’ about, so the hands of time will not pass and forget Dolly Shepherd again. I am Archives and Special Collections Manager within the University Library. My role is to manage and develop the Library's and other University research collections and exploit digital technologies to reach new audiences for these collections. I also advise to staff and students in the humanities on the use of digital technology in their research. Thank You Dr Dixon for your guidance & for your help. Also for publishing my letter regarding my research on Miss Dolly Shepherd, The Edwardian Lady Parachutist, it is such an honour for me and means a lot to me! From A Chance Find Back In August 2015 My Miss Dolly Shepherd (1886–1983) Journey Has Really Been Amazing. You’re very welcome Debra. Thank you for sharing Dolly’s story with us!